Tractor lights use a variety of different types of wiring methods. Large tractors use a wiring system like an automobile's, which can run off of the tractor battery if needed. 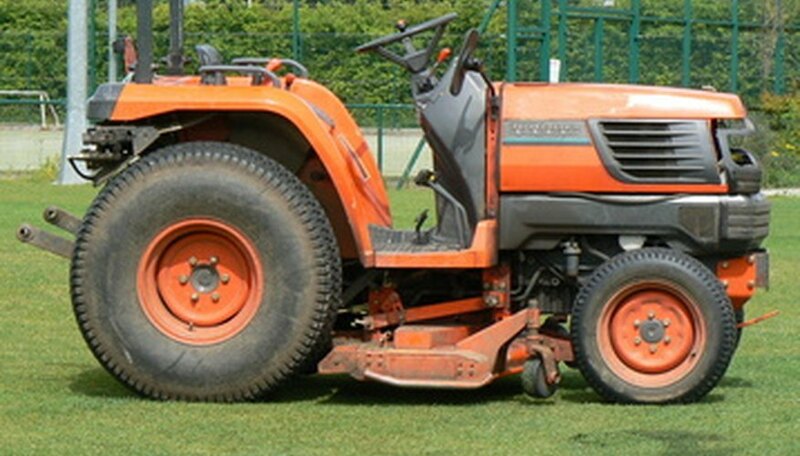 Smaller tractors such as lawn tractors use an alternating current system to power the lights. With this system, the lights will not run unless the engine is running. The engine's magnetron generator is used to produce the power needed for the lights.This system is very common. Locate the wires that originate at the magnetron. The magnetron is located underneath the engine flywheel on most tractors. The magnetron is a generator that uses the permanent magnets attached to the flywheel to produce power. This generator usually has two outputs. The first output is direct current and the second output is alternating current. The direct current is used to recharge the tractor's battery and is usually a red wire. The alternating current output is used to power the tractor lights. The alternating current is usually delivered through a black wire and a white wire. These wires can also be labeled. Connect the black wire of the alternating current output of the magnetron to one of the two terminals of the light switch. Connect the second terminal of the light switch to terminal "A" of the first tractor light. Connect terminal "B" of the first tractor light to the white wire of the magnetron. Connect terminal "A" of the second tractor light to terminal "A" of the first light. Then connect terminal "B" of the second tractor light to terminal "B" of the first light. This places these two headlights in a parallel wiring configuration. Start the engine and turn the light switch on. The lights should remain on as long as the engine is running.